University Lands manages the surface and mineral interests of 2.1 million acres of land across 19 counties in west Texas. Its revenue goes to the Permanent University Fund (PUF), one of the largest university endowments in the United States, that benefits operational and capital improvements for both the University of Texas and Texas A&M University systems. Since 1923, oil and gas production have been key sources of income for the PUF. University Lands leases its land to companies for oil and gas development and retains royalty interest in production. To ensure that companies’ drilling operations were staying inside the boundaries of their leases and that University Lands was receiving accurate royalty payments, analysts from the land and regulatory departments needed to be able to quickly identify oil and gas wells traversing through leases and view perforations (oil and gas extraction points) along that trajectory. This required having a 3D view of the leased land, including the depths of mineral deposits and the horizontal wells (laterals) being used to extract oil and gas. 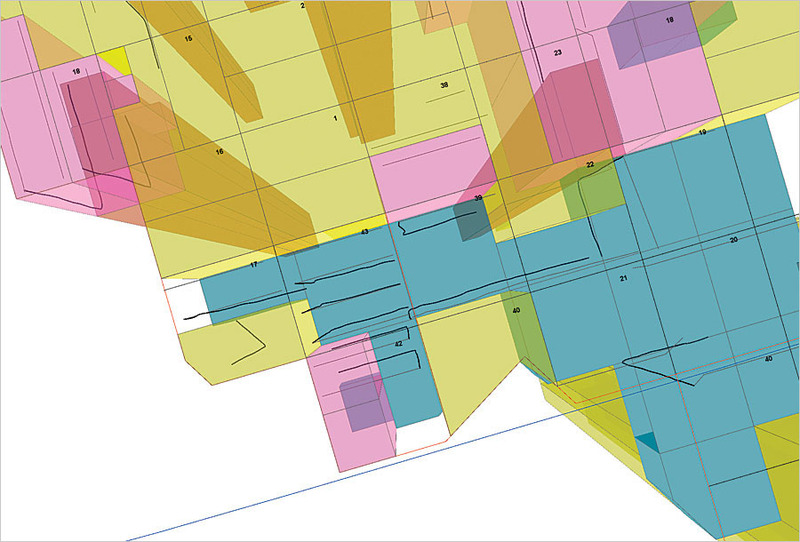 Since analysts at University Lands were already familiar with using ArcGIS for portions of their work, the organization’s GIS team decided that ArcGIS Pro would be the best solution for integrating their workflows entirely. 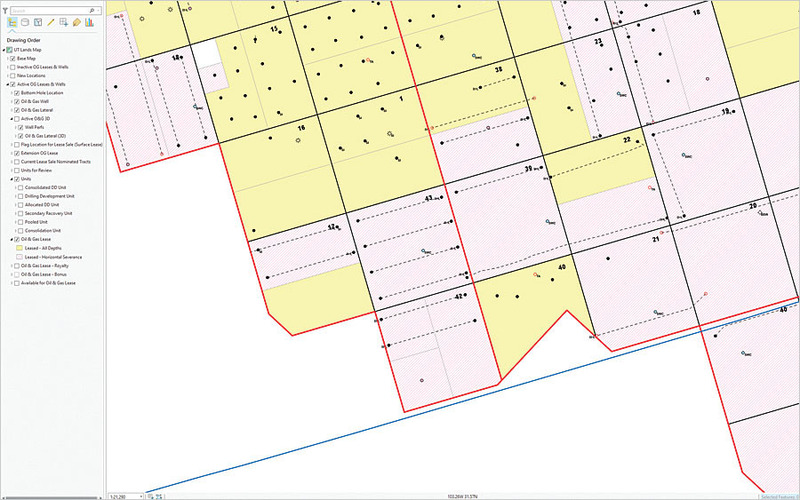 Analysts use ArcGIS Pro mostly to view wells, laterals, and leases. This map shows them in 2D. Prior to implementing ArcGIS Pro, land and regulatory analysts at University Lands had to juggle information housed in various repositories. For each well, land analysts would use ArcReader to determine where the well was—and if it was located where it was supposed to be. Then they would scour horizontal directional drilling reports to get the maximum depth of the well and figure out if its owner was drilling in the correct range for its lease. Regulatory analysts would use the measuring tool in ArcReader to determine the locations of perforations so they could validate which lease a company was obtaining its production from. With ArcGIS Pro, however, analysts in both departments could view 3D data on their 2D maps without having to open another application. The program’s ribbon interface is contextual, giving users the tools they need when they need them. And ArcGIS Pro has seamless panning, zooming, and labeling, which enables the University Lands analysts to visually inspect the leases and laterals faster than they could have before. To implement ArcGIS Pro, University Lands GIS analysts Ray Jimenez and Ben Kennady converted the lateral data from CSV files into layers that can be viewed in 3D scenes. They used Python scripting along with ArcPy, a Python site package, to display the leases and laterals in 3D in ArcGIS Pro. 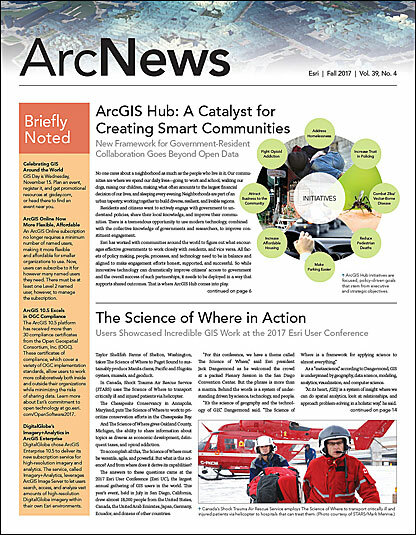 The scripts allowed the land and regulation analysts, who were only moderately familiar with GIS, to incorporate a focused view of data into their current workflows. Finally, the subsurface data was displayed in an ArcGIS Pro scene so that analysts could examine the leases and well laterals in a 3D environment, using just one program. This map shows the wells, laterals, and leases in 3D, making it easier to see the depths of the mineral deposits and the horizontal wells (laterals) being used to extract oil and gas. Now, analysts from University Lands’ land department can better assess whether companies are operating within their leased land agreements, and the organization’s regulatory and accounting departments can ensure that companies are reporting their production figures accurately. “ArcGIS Pro easily integrated into our existing enterprise GIS system and gave us the 3D view we needed while saving us the cost of purchasing a new software solution,” said Jimenez. Implementing ArcGIS Pro allowed University Lands to maintain the IT infrastructure it was already using while enhancing some of its most important workflows. The GIS team only had to train users on how to look at and narrow the focus of the data in ArcGIS Pro, since the interface was different from what they had used before, rather than teaching them a whole new suite of technology. And sticking with the ArcGIS platform is making subsequent development of the tools pretty simple. The GIS team is also looking to include a tool in ArcGIS Pro that breaks up laterals where they intersect with lease lines so University Lands can measure the length of the lateral in each lease. “This will make regulatory analyst jobs even easier so they don’t have to measure out the lateral themselves,” added Jimenez. For more information on how University Lands implemented ArcGIS Pro, email Jimenez.